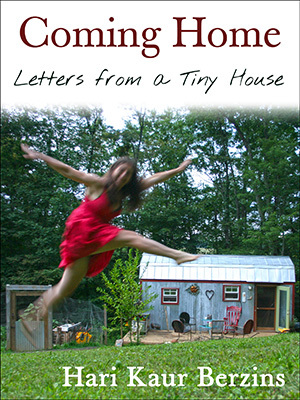 I’m so happy to welcome Mud Bailey as our first guest on Tiny House Family. She and her family are living a beautifully simple life. Enjoy! And thanks for reading. 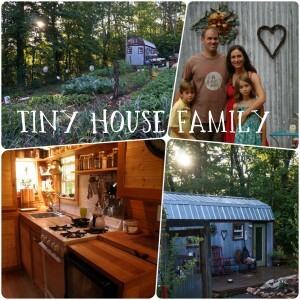 Hello Tiny House Family readers! My name is Meredith “Mud” Bailey. My friends call me Mud. I live just down the mountain from Hari, Karl and the kids in Stuart, VA on a property with 7 small cabins. We call our homestead Hawk-Mo. I live here with my boyfriend, my mother, dogs, cats, ducks and chickens. We have a 1/4 acre fenced garden with raised beds and an established, but neglected, small orchard. We are lucky enough to live and work on our homestead. We run our small business, Ragged Edge, from one of our cabins. We make wallets and sell them through our website, RAGGEDedgeGear and on Etsy. I blog about homesteading and entrepreneurship at the Hawk-Mo Hotwire and share on the Hawk-Mo Collective Facebook Page. Raised beds full of bounty. The fourth Hawk-Mo chicken coop. I used to wake up everyday with this tension in my chest that wouldn’t go away. My brain was occupied by nagging thoughts and the knowledge that things could be different. I felt like I was living two lives–my real life and my dream life. In my real life, I felt like a dysfunctional human being trying very hard to fit in. In my dream life, I did things that made sense to me from the way I saw the world, and I was happier. Figuring out how to live my dream life is the journey I began in earnest a year or so after college. I’d gotten fired from my previous four jobs for a basic unwillingness to stick my head in the sand and do what I was told regardless. I can trace my stubborn persistence to go against the grain all the way back to college. My mother can probably trace it back further than that. Since my college days, the following tips and tricks have served me well. If what you want more than anything is to do your own thing, these are for you. Show up. I used to say, “I don’t have time” for this or that. Now, if I’m not doing something, I say, “It’s not on the top of my priority list.” The truth is, I make time for the things that matter to me the most. I’ve learned that it takes nearly daily care to cultivate a dream or a big project and see it come to fruition. Last year, I went out in the garden maybe every 3 or 4 days, and when the hot Summer weather hit, I pretty much quit planting things. It was an OK harvest for a first year garden. This year, I promised myself that I would at the very least walk through it once a day and it’s paid off in spades. I water things I would have forgotten about, harvest things before it’s too late, and I’m able to keep up with weeding by just doing a bed here and there as I walk by. Instead of the garden feeling like a chore as it did last year, I can’t help but smile just walking through the gate. Work hard. There’s no sugar-coating this one. Sometimes you just have to roll up your sleeves, get your hands dirty, and sweat it out. There is no substitute. Over the course of the 6 years that I’ve been self-employed and solely dependent on our small business for a paycheck, I’ve learned to fight for my dreams. We’ve hit two really low points, dips so low that we worried about having to go get “real” jobs. And each time, we dug in, and fought back because we believed in ourselves and we were willing to do whatever it took. Dream chasing isn’t easy, but the reward is most certainly worth it. Have a beginner’s mind. “In the beginner’s mind there are many possibilities, but in the expert’s there are few.” – Zen Master Shunryo Suzuki. As a beginner, you don’t expect immediate success. You’re prepared to mess up, to fail, to have to re-do or try again. Giving yourself permission to be imperfect is glorious. Instead of being paralyzed by fear of doing something wrong (which happens all the time on our dear homestead), we accept that mistakes are part of doing and are actually the best teachers. We’ve kept chickens for 3 years now and my mother is now building our 4th chicken coop. She’s not angry that she wasted so much time/energy/money building the others, instead she’s excited that she is able to incorporate all the design improvements and ideas that she’s had from seeing how her other coops worked or didn’t. She’s enjoying the process of keeping chickens and the learning curve that goes with it. This is the main cabin where Mud’s mom lives. The cabin into which the Ragged Edge crew is moving the studio. This is where Mud lives and creates. Find your community. Your community is your support group. Surround yourself. Find it online or in person, the best is both. It’s absolutely invaluable to your journey. Your community will encourage you and make it easier for you to let go of other people’s expectations that aren’t supportive of what you’re chasing. Your community should inspire you, and you, should in turn, give back to that circle of inspiration. Your community will become your family, your helping hand, your resource, your shoulder to cry on, and your cheerleader. It will be full of people who genuinely appreciate what you’re doing. And when it’s time to celebrate, they’ll be more than happy to help! More than anything, we moved to Floyd for this. Having people around us that are accepting, understanding and encouraging has pushed us faster and further down our path than I could have ever imagined possible 4 years ago. Often times, at the end of the year, when I’m reviewing my dream list and rewriting it, I find myself surprised by how far we’ve come. Now I think DREAM EVEN BIGGER before writing next years list. Identify your obstacles. This is mostly important so that you can squash them. Be it money, time, place or obligations, somehow it’s always easier to for me to find a work-around when I know exactly what I’m trying to do. For example, at Hawk-Mo, we are constantly working to improve our basic infrastructure. We have a bunch of semi-functional structures that need work. In a fairy tale world, we would just hire someone to build us a garage/workshop, put an addition on my cabin and add electricity to some of the others. But we don’t live in a fairy tale world, and we don’t have the cash to make that happen, so we live with what we have, affording small improvements as we can. The beauty of this is that it’s given us time to figure out what we really need and what’s really important. Instead of building a whole big “real” workshop for our business which we thought we had to do to get it out of our small (but big enough) house that needs serious work, we figured out how to cram it into one of the existing cabins by reworking some of the tables and using more shelves and wall storage. This has the domino effect of making the rest of the work doable by us a little bit at a time. Ignore the naysayers. This requires practice. And it will be much easier to accomplish if you have some friends in your community to call upon when you need to discuss just how frustrating it is to hear someone you probably like very much, maybe even love, tell you that you’re crazy for wanting to do something and/or thinking it will actually work. I’ve tried to live to the beat of my own drum for seven years, and I still let what other people think get under my skin. Every time I do I become an unproductive mess of a human being while I rant and rave and question everything about my existence that isn’t “normal.” Sometimes I’m incapable of seeing my way straight for days, and the only way to get over it is to go through it. It is not a pretty sight. What I’ve learned is that some people are against change. These people are unable to consider that everything they think they might know about how the world works could be wrong. And once you allow yourself to believe that possibility, it’s like falling down a rabbit hole of wonder and curiosity. Your world will never be the same. You can’t help but see open doors, connections, and new opportunities everywhere. Be excited. Excitement is quite possibly the best motivator on the planet. When I’m excited about something, even the really hard work is downright enjoyable. At first, most new things are exciting. The hard part comes when the newness wears off, and/or things aren’t going as planned which happens often in my experience. When I’m feeling not-so-very-excited, I make an effort to seek out some inspiration. Sometimes I find a blog post or a book that gets my head going back in the right direction. Sometimes all I need is a break from my routine and my thoughts. When I come back to my project, I’m refreshed. The important thing is to recognize when your excitement level is lacking, and do something about it. Be the small fish in a big pond. This has propelled me forward the fastest whenever I set out to learn something new. It’s the immersion principle. When I surround myself with a bunch of people already further down the path of what I think I want to do, it makes it easier to succeed. When I was in school for ceramics, I made it a point to hang out at the studio all the time. I made friends with the teachers, the techs, other undergrads and the grad students. I gained access to equipment, knowledge and resources I would otherwise not have had. I ended up knowing how to fire any one of the dozen kilns they had. This exposure and experience helped me earn a research grant for glaze experimentation. Our community of Floyd is another big pond. We are surrounded by independent thinkers, homesteaders, and artists. People live their lives outside of the box of college, career, marriage, house, kids, retirement; they are game-changers. We now have friends who are farmers, entrepreneurs, and passionate dream-chasers. These people are full of optimism, despite what some would call unfavorable circumstances. And because of those relationships, we are driven even more to live life on our terms. Redefine success. “In his view, we were already a success, because we were doing something hard and it was something that mattered to us. You don’t measure things like that with words like success or failure, he said. Satisfaction comes from trying hard things and then going on to the next hard thing, regardless of the outcome. What mattered was whether or not you were moving in a direction you thought was right.” – Kristin Kimball, The Dirty Life: On Farming, Food, and Love. I don’t think it can be said much better than Kristin said it. Stretching involves not knowing what you’re in for. It means doing things that might not work, and doing them anyway. If you look at it like every mistake is an opportunity to learn, then success becomes less about doing it right, and more about doing it, about persevering. Commit to giving something an honest to goodness shot because that’s what you want to be doing. Hari here. First, I want to thank Mud for her heartfelt post. I am inspired especially by “Show up.” This is really it, isn’t it? Rather than think about what needs to be done, show up for it. Get in there, and do it. Every little minute counts. Oh, but I’m inspired by so much here. I’ll be returning to this one again and again. What wisdom you have, Mud! Folks, show her some love by following her on her blog, Facebook and checking out RAGGEDedge products–handmade right on Hawk-Mo. To anyone out there who feels inspired to write a guest post for our readers, here’s how. Thanks Becky! And nice to meet you as well. I read in a permaculture book a couple of years ago that the best way to have an awesome garden, was to make your garden someplace you enjoyed spending time. Reading that changed everything for me. I’ve created a garden space that I truly enjoy. I wander around, from this bed to the next, not so much doing anything, as simply watching, observing, soaking in the beauty and miracles abound. When the weather is just right, I do it for hours. Me, too! Sometimes I get totally lost in my garden. I love it. In summertime, it doesn’t even feel like we live in a tiny house. The garden is my home. Yes! I also have sections for flowers in my garden–for several reasons: to attract pollinators, to have one area to maintain, and to save them from the deer. I have a deer run through my yard, and the garden is fenced in with a high fence. I also have birdbaths in and nearby the garden. Another upside to regular time in the garden? You find those tomato horn worms before they do *too* much damage. Thanks, Hari, for sharing Mud’s much-needed wisdom. I, too, will hang on to this post by keeping it close-by to refer to on my journey, which will be filled with hills & valleys while I work toward my goal of a tiny home in a close-knit, loving, supportive community. I’m happy to have this space to share. So glad you enjoyed Mud’s post, Sue. I’m sure you are well on your way to your dream.